There are many ways for you to learn and improve your English, such as to hire a teacher, to go to school, to take an online course, and so on. And among those ways, the cheapest and still efficient way is to learn English online for free. Elllo focuses on your English listening skill. You can listen to speakers from all over the world for different topics, such as sports, travels, games, and so on. There is related text script under the audio player. You can also listen to some nice English songs or watch some videos. Fun Easy English mainly focuses on the basic English knowledge and teaching tips, its courses include pronunciation, grammar, idioms, slang, writing, tests and much more. Most of those courses are launched in Video format, in addition with text scripts and pictures. Go4English.com is owned by British Council, which is the UK’s international cultural relations body. The website offers English learning information and tests for teachers, students and kids. You can learn English online while you are taking a test, listening to a song, or even playing a game. Lang-8 focuses on writing in a foreign language. You write in the language that you are learning, then native speakers will correct your writing, and you can also help others learn your native language by correcting their writing. For every language you choose to learn, Busuu provides a few courses, including writing exercises, vocabulary training, reading comprehension, and so on. Besides courses, you can also learn English online by joining the community and chatting with other members. The Livemocha website focuses on learning a foreign language by courses and communications. To learn English online, you can pick up an English course, submit your answers, or chat with the members whose native language is English. And you can help other members by checking their submissions. VocabSushi is for you to learn vocabulary with real-world, contextual examples found in the daily news. You pick up a vocab word, understand its means, read the sentence samples, listen to the speakers, then you can take a test and check if you have learned that word. On the BBC Learning English website, you can learn grammar, vocabulary, pronunciation, and so on, you can take a test, you can also learn how to teach others English. The most interesting course is 6 Minute English, in which you can listen to a short audio record, which can be downloaded both in MP3 and PDF formats. 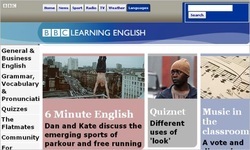 With an over 10 years history, Learn English Free Online is an abundant website for EFL/ESL learners and teachers. You can learn vocabulary with the related pictures, you can get some English learning tips, you can take some funny test, and so on. As the name, the website Exam English is for you to take exams, including TOEFL, CPE, KET, and nearly all the other famous international ESL/EFL exams. You can test your English level by reading, listening, grammar, vocabulary, or writing separately.